Bhubaneswar: AirAsia will introduce a new India -Thailand connection with Bhubaneswar-Bangkok flight from December 7, said an official on Wednesday. 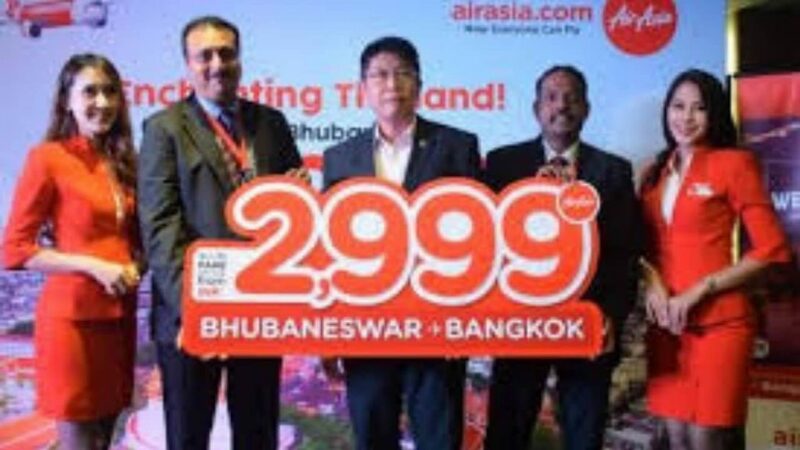 The Bhubaneswar-Bangkok AirAsia flight will fly three times in a week- Wednesday, Friday and Sunday-starting on December 7 at a promotional fare from only Rs 2999 per trip. The booking of tickets will be between 10 – 21 October for travel from December 7 to March 30, 2019. The flight addition comes alongside Visakhapatnam-Bangkok, flying 4 times a week starting from December 8. Rajkumar Paranthaman, Head of Marketing, AirAsia India said that AirAsia plans to continually penetrate the Indian market in the latter half of 2018 as it is a major market with great growth potential. He said Bangkok and other Thai cities have proven popular destinations for Indians with their ability to respond to a wide variety of travel styles from marvellous shopping and night-time entertainment to hospitality wellness retreat as well as many world-class beach cities. The airline is excited to be bringing India and Thailand closer through convenient and affordable travel and to offer the people of Bhubaneswar more alternatives in travel through AirAsia’s Fly-Thru service and best connectivity offered. Commenting on the launch, Odisha Chief Minister Naveen Patnaik said, “I’m delighted to know that Thai Air Asia is commencing a direct BKK-BBI flight from 6th Dec this year. We have been trying to improve international connectivity from Bhubaneswar. I’m sure this will boost international travel and tourism between Odisha & South East Asia. I convey my best wishes to Thai Air Asia”. Govt. of Odisha is taking 100 per cent initiative to make this state as one of the major tourist destinations of the world, having immense potential in the field of Buddhist, Pilgrimage, Beach, Tribal, Eco and Cultural Tourism, he added. Thai AirAsia (flight code FD) presently flies direct from India to Thailand from the 5 cities of Chennai, Bangalore, Kolkata Jaipur and Kochi.